I have been entranced by Zero Mostel all of my conscious life. For my initial introduction, I thank my parents and most particularly my movie and theatre-loving mother. She took me to my first showing of The Producers (the original film). I read on my own about his theatre and family-building past in the delightful 1978 memoir written by his wife Kate Mostel (along with Madeline Gilford, Jack’s spouse) entitled 170 Years of Show Business. My mom contended in the 1970s that Mostel’s testimony before the House Un-American Activities Committee would make a fabulous play — and I have her highlighted hardback copy of Eric Bentley‘s 1971 edited volume of testimony excerpts Thirty Years of Treason before me at this moment to prove her creative impulses. And prominent among my recent theatrical and creative adventures, I have been mulling the strengths and weakness of the one person play through illustrative examples and a current project in development, as illustrated by prior blog posts (e.g. http://wp.me/pHkrs-r2). You could say that as I take my seat before this one man play about Mostel, I am prepared to be told a tale. 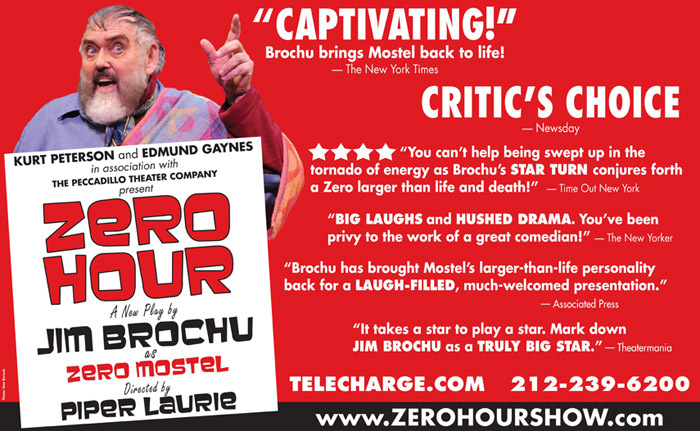 Zero Hour, currently enjoying a run at the Actors Temple Theatre (after earlier runs in New York, DC, and Florida, among other locales) starring writer and actor Jim Brochu as the man himself, is a pleasant intermission less 90 minutes storytelling adventure. Director Piper Laurie has crafted movement and moments that keep us in the present and place us in specific moments in the past. Lights and spare set by Josh Iacovelli frame and multipurpose elegantly (a goose neck desk lamp becomes a hearing room microphone, water and a brush provide endless splashy fun, and lights through a scrim-y skylight highlight the loft studio locale as well as frame multiple scenic opportunities). Yes, you can obtain the same pastiche of stories and snippets of transcripts from the memoir I cite above, and from transcripts of Mostel’s HUAC testimony. What you do receive in this theatrical experience is the stories told to you, through the emotional highs and lows, by a man who seems to embody the spirit and the physicality of the Mostel we remember on stage (those of us privileged to have seen him there) or on film or otherwise recorded. What a presence. What a life. This production condenses what was crafted as a two act adventure into one act — one intermission-less experience. I learned this by reviewing the script purchased at the theatre after curtain. This fact may help to explain my sense that the first 45 minutes or so felt monotonic — long — relentlessly similarly paced and voiced. The emotional outburst reserved for the end of the first act (after relaying the death of his dear friend, by suicide, after enduring years of the Blacklist) is removed in the current production, that emotional upswing edited out, which serves a purpose in the arc of this play’s emotional life. A break for discussion and pause and pondering. then a return to a second act (also slightly edited in this production) that focuses with delicious delicacy and nuance on the Blacklist, the HUAC experience and yes, a wonderful sequence with edited bits of Mostel’s testimony before the committee. What better than the man’s own words. (Once again, my mother illustrates her brilliant instincts.) The one-act version gets us to the finish line through the high lights, but the original layered experience provides powerful arcs that are lost. After an hour or so of emoting and sharing devastating and exhilarating life stories, this same Mostel feels closer to his young interviewer. They indeed have formed a relationship. And we in the audience feel quite close to him.